This article is about the English city. For the city in Massachusetts, United States, see Cambridge, Massachusetts. For other uses, see Cambridge (disambiguation). Cambridge (/ˈkeɪmbrɪdʒ/ KAYM-brij) is a university city and the county town of Cambridgeshire, England, on the River Cam approximately 50 miles (80 km) north of London. At the United Kingdom Census 2011, its population was 123,867 including 24,506 students. Cambridge became an important trading centre during the Roman and Viking ages, and there is archaeological evidence of settlement in the area as early as the Bronze Age. The first town charters were granted in the 12th century, although modern city status was not officially conferred until 1951. The world-renowned University of Cambridge was founded in 1209. The buildings of the university include King's College Chapel, Cavendish Laboratory, and the Cambridge University Library, one of the largest legal deposit libraries in the world. The city's skyline is dominated by several college buildings, along with the spire of the Our Lady and the English Martyrs Church, the chimney of Addenbrooke's Hospital and St John's College Chapel tower. Anglia Ruskin University, which evolved from the Cambridge School of Art and the Cambridgeshire College of Arts and Technology, also has its main campus in the city. The first game of association football took place at Parker's Piece. The Strawberry Fair music and arts festival and Midsummer Fair are held on Midsummer Common, and the annual Cambridge Beer Festival takes place on Jesus Green. The city is adjacent to the M11 and A14 roads. Cambridge station is less than an hour from London King's Cross railway station. Settlements have existed around the Cambridge area since prehistoric times. The earliest clear evidence of occupation is the remains of a 3,500-year-old farmstead discovered at the site of Fitzwilliam College. Archaeological evidence of occupation through the Iron Age is a settlement on Castle Hill from the 1st century BC, perhaps relating to wider cultural changes occurring in southeastern Britain linked to the arrival of the Belgae. The principal Roman site is a small fort (castrum) Duroliponte on Castle Hill, just northwest of the city centre around the location of the earlier British village. The fort was bounded on two sides by the lines formed by the present Mount Pleasant, continuing across Huntingdon Road into Clare Street. The eastern side followed Magrath Avenue, with the southern side running near to Chesterton Lane and Kettle's Yard before turning northwest at Honey Hill. It was constructed around AD 70 and converted to civilian use around 50 years later. Evidence of more widespread Roman settlement has been discovered including numerous farmsteads and a village in the Cambridge district of Newnham. Following the Roman withdrawal from Britain around 410, the location may have been abandoned by the Britons, although the site is usually identified as Cair Grauth listed among the 28 cities of Britain by the History of the Britons. Evidence exists that the invading Anglo-Saxons had begun occupying the area by the end of the century. Their settlement – also on and around Castle Hill – became known as Grantebrycge ("Granta-bridge"). (By Middle English, the settlement's name had changed to "Cambridge" and the lower stretches of the Granta changed their name to match.) Anglo-Saxon grave goods have been found in the area. During this period, Cambridge benefited from good trade links across the hard-to-travel fenlands. By the 7th century, the town was less significant and described by Bede as a "little ruined city" containing the burial site of Etheldreda. Cambridge was on the border between the East and Middle Anglian kingdoms and the settlement slowly expanded on both sides of the river. The arrival of the Vikings was recorded in the Anglo-Saxon Chronicle in 875. Viking rule, the Danelaw, had been imposed by 878 Their vigorous trading habits caused the town to grow rapidly. During this period the centre of the town shifted from Castle Hill on the left bank of the river to the area now known as the Quayside on the right bank. After the Viking period, the Saxons enjoyed a return to power, building churches such as St Bene't's Church, wharves, merchant houses and a mint, which produced coins with the town's name abbreviated to "Grant". In 1068, two years after his conquest of England, William of Normandy built a castle on Castle Hill. Like the rest of the newly conquered kingdom, Cambridge fell under the control of the King and his deputies. The first town charter was granted by Henry I between 1120 and 1131. It gave Cambridge monopoly of waterborne traffic and hithe tolls and recognised the borough court. The distinctive Round Church dates from this period. In 1209, Cambridge University was founded by students escaping from hostile townspeople in Oxford. The oldest existing college, Peterhouse, was founded in 1284. In 1349 Cambridge was affected by the Black Death. Few records survive but 16 of 40 scholars at King's Hall died. The town north of the river was severely affected being almost wiped out. Following further depopulation after a second national epidemic in 1361, a letter from the Bishop of Ely suggested that two parishes in Cambridge be merged as there were not enough people to fill even one church. With more than a third of English clergy dying in the Black Death, four new colleges were established at the university over the following years to train new clergymen, namely Gonville Hall, Trinity Hall, Corpus Christi and Clare. In 1382 a revised town charter effects a "diminution of the liberties that the community had enjoyed", due to Cambridge's participation in the Peasants' Revolt. The charter transfers supervision of baking and brewing, weights and measures, and forestalling and regrating, from the town to the university.King's College Chapel, was begun in 1446 by King Henry VI. The chapel was built in phases by a succession of kings of England from 1446 to 1515, its history intertwined with the Wars of the Roses, and completed during the reign of King Henry VIII. The building would become synonymous with Cambridge, and currently is used in the logo for the City Council. Following repeated outbreaks of pestilence throughout the 16th Century, sanitation and fresh water were brought to Cambridge by the construction of Hobson's Conduit in the early 1600s. Water was brought from Nine Wells, at the foot of the Gog Magog Hills, into the centre of the town. Cambridge played a significant role in the early part of the English Civil War as it was the headquarters of the Eastern Counties Association, an organisation administering a regional East Anglian army, which became the mainstay of the Parliamentarian military effort before the formation of the New Model Army. In 1643 control of the town was given by Parliament to Oliver Cromwell, who had been educated at Sidney Sussex College. The town's castle was fortified and garrisoned with troops and some bridges were destroyed to aid its defence. Although Royalist forces came within 2 miles (3 km) of the town in 1644, the defences were never used and the garrison was stood down the following year. In the 19th century, in common with many other English towns, Cambridge expanded rapidly, due in part to increased life expectancy and improved agricultural production leading to increased trade in town markets. The Inclosure Acts of 1801 and 1807 enabled the town to expand over surrounding open fields and in 1912 and again in 1935 its boundaries were extended to include Chesterton, Cherry Hinton, and Trumpington. The railway came to Cambridge in 1845 after initial resistance, with the opening of the Great Eastern Railway's London to Norwich line. The station was outside the town centre following pressure from the university to restrict travel by undergraduates. With the arrival of the railway and associated employment came development of areas around the station, such as Romsey Town. The rail link to London stimulated heavier industries, such as the production of brick, cement and malt. From the 1930s to the 1980s, the size of the city was increased by several large council estates. The biggest impact has been on the area north of the river, which are now the estates of East Chesterton, King's Hedges, and Arbury where Archbishop Rowan Williams lived and worked as an assistant priest in the early 1980s. During the Second World War, Cambridge was an important centre for defence of the east coast. The town became a military centre, with an R.A.F. training centre and the regional headquarters for Norfolk, Suffolk, Essex, Cambridgeshire, Huntingdonshire, Hertfordshire, and Bedfordshire established during the conflict. The town itself escaped relatively lightly from German bombing raids, which were mainly targeted at the railway. 29 people were killed and no historic buildings were damaged. In 1944, a secret meeting of military leaders held in Trinity College laid the foundation for the allied invasion of Europe. During the war Cambridge served as an evacuation centre for over 7,000 people from London, as well as for parts of the University of London. Cambridge was granted its city charter in 1951 in recognition of its history, administrative importance and economic success. Cambridge does not have a cathedral, traditionally a prerequisite for city status, instead falling within the Church of England Diocese of Ely. In 1962 Cambridge's first shopping arcade, Bradwell's Court, opened on Drummer Street, though this was demolished in 2006. Other shopping arcades followed at Lion Yard, which housed a relocated Central Library for the city, and the Grafton Centre which replaced Victorian housing stock which had fallen into disrepair in the Kite area of the city. This latter project was controversial at the time. Map showing the 2010 electoral boundaries of the city, with postcode districts superimposed. Cambridge is a non-metropolitan district served by Cambridge City Council. 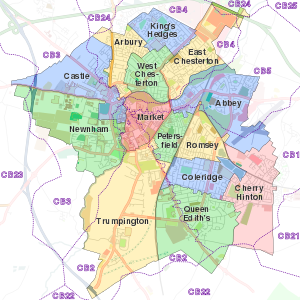 Cambridge Local Authority District covers most of the City's urban area but some extends outside this into South Cambridgeshire District. Cambridge is one of five districts within the county of Cambridgeshire, and is bordered on all sides by the mainly rural South Cambridgeshire district. The city council's headquarters are in the Guildhall, a large building in the market square. Cambridge was granted a Royal Charter by King John in 1207, which permitted the appointment of a Mayor, although the first recorded Mayor, Harvey FitzEustace, served in 1213. City councillors now elect a mayor annually. For electoral purposes the city is divided into 14 wards: Abbey, Arbury, Castle, Cherry Hinton, Coleridge, East Chesterton, King's Hedges, Market, Newnham, Petersfield, Queen Edith's, Romsey, Trumpington, and West Chesterton. The political composition of the city council is currently: 25 Labour councillors, 14 Liberal Democrat, 2 independent and one Conservative. Each of the 14 wards also elects councillors to Cambridgeshire County Council. Responsible for services including school education, social care and highways, since 2017 the County Council has been controlled by the Conservative Party. The parliamentary constituency of Cambridge covers most of the city. Daniel Zeichner (Labour) was elected Member of Parliament (MP) at the 2015 general election, replacing Julian Huppert, a Liberal Democrat. He was re-elected in the 2017 general election. One area of the city, Queen Edith's ward, lies in the South Cambridgeshire constituency, whose MP is Heidi Allen (Independent). Allen was also elected in 2015, succeeding Andrew Lansley, and was re-elected in 2017. The city had previously elected a Labour MP from 1992 to 2005 and prior to this, usually elected a Conservative after the Second World War. However, the Conservatives have seen their share of the vote fall over the past 20 years. The University of Cambridge formerly had two seats in the House of Commons; Sir Isaac Newton was one of the most notable MPs. The Cambridge University constituency was abolished under 1948 legislation, and ceased at the dissolution of Parliament for the 1950 general election, along with the other university constituencies. The underlying geology of Cambridge consists of gault clay and Chalk Marl, known locally as Cambridge Greensand, partly overlaid by terrace gravel. A layer of phosphatic nodules (coprolites) under the marl were mined in the 19th century for fertiliser. It became a major industry in the county, and its profits yielded buildings such as the Corn Exchange, Fulbourn Hospital and St. John's Chapel until the Quarries Act 1894 and competition from America ended production. The River Cam flows through the city from the village of Grantchester, to the southwest. It is bordered by water meadows within the city such as Sheep's Green as well as residential development. Like most cities, modern-day Cambridge has many suburbs and areas of high-density housing. The city centre of Cambridge is mostly commercial, historic buildings, and large green areas such as Jesus Green, Parker's Piece and Midsummer Common. Many of the roads in the centre are pedestrianised. Population growth has seen new housing developments in the 21st century, with estates such as the CB1 and Accordia schemes near the station, and developments such as Great Kneighton, formally known as Clay Farm, and Trumpington Meadows currently under construction in the south of the city. Other major developments currently being constructed in the city are Darwin Green (formerly NIAB), and University-led developments at West Cambridge and North West Cambridge, (Eddington). The city has an oceanic climate. (Köppen: Cfb). Cambridge currently has two official weather observing stations, the National Institute of Agricultural Botany (NIAB), about 2 miles (3 km) north of the city centre near Girton, and the Cambridge University Botanic Garden, about 1 mile south of the city centre. In addition, the Digital Technology Group of the University's Computer Laboratory maintains a weather station on the West Cambridge site, displaying current weather conditions online via web browsers or an app, and also an archive dating back to 1995. The city, like most of the UK, has a maritime climate highly influenced by the Gulf Stream. Located in the driest region of Britain, Cambridge's rainfall averages around 570 mm (22.44 in) per year, around half the national average, with some years occasionally falling into the semi-arid (under 500 mm (19.69 in) of rain per year) category. The last time this occurred was in 2011 with 380.4 mm (14.98 in) of rain at the Botanic Gardens and 347.2 mm (13.67 in) at the NIAB site. Conversely, 2012 was the wettest year on record, with 812.7 mm (32.00 in) reported. Snowfall accumulations are usually small, in part because of Cambridge's low elevation, and low precipitation tendency during transitional snow events. Owing to its low lying, inland, and easterly position within the British Isles, summer temperatures tend to be somewhat higher than areas further west, and often rival or even exceed those recorded in the London area. July 2006 for example recorded the highest official mean monthly maximum (i.e. averaged over the entire month) of any month at any location in the UK since records began; 28.3 °C (82.9 °F), at both the NIAB and Botanic Garden observing stations. Cambridge also often records the annual highest national temperature in any given year – 30.2 °C (86.4 °F) in July 2008 at NIAB and 30.1 °C (86.2 °F) in August 2007 at the Botanic Garden are two recent examples. The absolute maximum stands at 36.9 °C (98.4 °F) set on 10 August 2003, although a temperature of 37.5 °C (99.5 °F) was recorded on the same day at the Guildhall rooftop weather station in the city centre and is acknowledged by the Met Office. Before this, the absolute maximum was 36.5 °C (97.7 °F) set at the Botanic Garden in August 1990. The last time the temperature exceeded 35 °C (95 °F) was July 2006 when the maximum reached 35.6 °C (96.1 °F) at the Botanic Garden and 35.8 °C (96.4 °F) at NIAB. Typically the temperature will reach 25.1 °C (77.2 °F) or higher on over 25 days of the year over the 1981–2010 period, with the annual warmest day averaging 31.5 °C (88.7 °F) over the same period. The absolute minimum temperature recorded at the Botanic Garden site was −17.2 °C (1.0 °F), recorded in February 1947, although a minimum of −17.8 °C (0.0 °F) was recorded at the now defunct observatory site in December 1879. More recently the temperature fell to −15.3 °C (4.5 °F) on 11 February 2012, −12.2 °C (10.0 °F) on 22 January 2013 and −10.9 °C (12.4 °F) on 20 December 2010. The average frequency of air frosts ranges from 42.8 days at the NIAB site, to 48.3 days at the Botanic Garden per year over the 1981–2010 period. Typically the coldest night of the year at the Botanic Garden will fall to −8.0 °C (17.6 °F). Such minimum temperatures and frost averages are typical for inland areas across much of southern and central England. Sunshine averages around 1,500 hours a year or around 35% of possible, a level typical of most locations in inland central England. The city contains three Sites of Special Scientific Interest (SSSIs), at Cherry Hinton East Pit, Cherry Hinton West Pit, and Travellers Pit, and ten Local Nature Reserves (LNRs): Sheep's Green and Coe Fen, Coldhams Common, Stourbridge Common, Nine Wells, Byron's Pool, West Pit, Paradise, Barnwell West, Barnwell East, and Logan's Meadow. Cambridge is completely enclosed by green belt as a part of a wider environmental and planning policy first defined in 1965 and formalised in 1992. While some small tracts of green belt exist on the fringes of the city's boundary, much of the protection is in the surrounding South Cambridgeshire and nearby East Cambridgeshire districts, helping to maintain local green space, prevent further urban sprawl and unplanned expansion of the city, as well as protecting smaller outlying villages from further convergence with each other as well as the city. Cambridge has a much higher than average proportion of people in the highest paid professional, managerial or administrative jobs (32.6% vs. 23.5%) and a much lower than average proportion of manual workers (27.6% vs. 40.2%). In addition, a much higher than average proportion of people have a high level qualification (e.g. degree, Higher National Diploma, Master's or PhD), (41.2% vs. 19.7%). The town's river link to the surrounding agricultural land, and good road connections to London in the south meant Cambridge has historically served as an important regional trading post. King Henry I granted Cambridge a monopoly on river trade, privileging this area of the economy of Cambridge  The town market provided for trade in a wide variety of goods and annual trading fairs such as Stourbridge Fair and Midsummer Fair were visited by merchants from across the country. The river was described in an account of 1748 as being "often so full of [merchant boats] that the navigation thereof is stopped for some time". For example, 2000 firkins of butter were brought up the river every Monday from the agricultural lands to the North East, particularity Norfolk, to be unloaded in the town for road transportation to London. Changing patterns of retail distribution and the advent of the railways led to a decline in Cambridge's importance as a market town. Today Cambridge has a diverse economy with strength in sectors such as research & development, software consultancy, high value engineering, creative industries, pharmaceuticals and tourism. Described as one of the "most beautiful cities in the world" by Forbes in 2010, with the view from The Backs being selected as one of the 10 greatest in England by National Trust chair Simon Jenkins, tourism generates over £750 million for the city's economy. Cambridge and its surrounds are sometimes referred to as Silicon Fen, an allusion to Silicon Valley, because of the density of high-tech businesses and technology incubators that have developed on science parks around the city. Many of these parks and buildings are owned or leased by university colleges, and the companies often have been spun out of the university. Cambridge Science Park, which is the largest commercial R&D centre in Europe, is owned by Trinity College; St John's is the landlord of St John's Innovation Centre. Technology companies include Abcam, CSR, ARM Limited, CamSemi, Jagex and Sinclair. Microsoft has located its Microsoft Research UK offices in West Cambridge, separate from the main Microsoft UK campus in Reading, and also has an office on Station Road. Cambridge was also the home of Pye Ltd., founded in 1898 by W. G. Pye, who worked in the Cavendish Laboratory; it began by supplying the University and later specialised in wireless telegraphy equipment, radios, televisions and also defence equipment. Pye Ltd evolved into several other companies including TETRA radio equipment manufacturer Sepura. Another major business is Marshall Aerospace located on the eastern edge of the city. The Cambridge Network keeps businesses in touch with each other. The software company Autonomy Corporation is located at the Business Park on Cowley Road. Because of its rapid growth in the 20th century, Cambridge has a congested road network. The M11 motorway from east London terminates to the north-west of the city where it joins the A14, a major freight route which connects the port of Felixstowe on the east coast with the Midlands. The A428 connects the city with Bedford and St Neots, and the A10 connects the city to King's Lynn to the north via Ely, and to central London to the south. As a university town lying on fairly flat ground and with traffic congestion, Cambridge has the highest level of cycle use in the UK. According to the 2001 census, 25% of residents travelled to work by bicycle. Furthermore, a survey in 2013 found that 47% of residents travel by bike at least once a week. In recognition of this, the 3rd stage of the 2014 Tour de France started in the city, adjacent to Parker's Piece. Cambridge has several bus services including routes linking five Park and Ride sites all of which operate seven days a week and are aimed at encouraging motorists to park near the city's edge. Since 2011, the Cambridgeshire Guided Busway has carried bus services into the centre of Cambridge from St Ives, Huntingdon, Peterborough and other towns and villages along the routes, operated by Stagecoach and Go Whippet. The A service continues on to the railway station and Addenbrookes, before terminating at a new Park and Ride in Trumpington. Since 2017 it has also linked to Cambridge North railway station. Cambridge also has its own airport; Cambridge Airport was used mainly by charter and training flights as well as to fly in aircraft for maintenance. Regular flights to Jersey and European destinations such as Gothenburg operated until the end of January 2016 when all scheduled and charter traffic from the airport was halted. Cambridge railway station was opened in 1845, initially linking to Bishopsgate station in London, via Bishops Stortford. Further lines opened throughout the 19th century, including the Cambridge and St Ives branch line, the Stour Valley Railway, the Cambridge to Mildenhall railway, and the Varsity Line. Another station was opened in Cherry Hinton though, at the time, this was a separate village to Cambridge. Several of these lines were closed during the 1960s. Today, Cambridge station has direct rail links to London with termini at London King's Cross (via the Cambridge Line and the East Coast Main Line), Liverpool Street (on the West Anglia Main Line), and St Pancras (on the Thameslink line). Commuter trains to King's Cross run every half hour during peak hours, with a journey time of 53 minutes. Trains also run to King's Lynn and Ely (via the Fen Line), Norwich (via the Breckland Line), Leicester, Birmingham, Peterborough, Stevenage, Ipswich, London Stansted Airport, Brighton and Gatwick Airport. A second railway station, Cambridge North, opened on 21 May 2017, having originally planned to open in March 2015. A third railway station, Cambridge South, near Addenbrooke's Hospital has been proposed. Both state and independent schools serve Cambridge pupils from nursery to secondary school age. State schools are administered by Cambridgeshire County Council, which maintains 251 schools in total, 35 of them in Cambridge city. Netherhall School, Chesterton Community College, the Parkside Federation (comprising Parkside Community College and Coleridge Community College), North Cambridge Academy and the Christian inter-denominational St Bede's School provide comprehensive secondary education. Many other pupils from the Cambridge area attend village colleges, an educational institution unique to Cambridgeshire, which serve as secondary schools during the day and adult education centres outside of school hours. Independent schools in the city include The Perse School, Stephen Perse Foundation, Sancton Wood School, St Mary's School, Heritage School and The Leys School. The city has one university technical college, Cambridge Academy for Science and Technology, which opened in September 2014. Cambridge played a unique role in the invention of modern football: the game's first set of rules were drawn up by members of the University in 1848. The Cambridge Rules were first played on Parker's Piece and had a 'defining influence on the 1863 Football Association rules' which again were first played on Parker's Piece. The city is home to Cambridge United FC, who play at the Abbey Stadium. Formed in 1912, as Abbey United, they were elected to the Football League in 1970 and reached the Football League Second Division in 1978, although a serious decline in them in the mid 1980s saw them drop back down to the Football League Fourth Division and almost go out of business. Success returned to the club in the early 1990s when they won two successive promotions and reached the FA Cup quarter finals in both of those seasons, and in 1992 they came close to becoming the first English team to win three successive Football League promotions which would have taken them into the newly created FA Premier League. But they were beaten in the playoffs and another decline set in, which was completed in 2005 when they were relegated from the Football League and for the second time in 20 years narrowly avoided going out of business. After nine years of non league football they returned to the Football League in 2014 by winning the Conference National playoffs. Cambridge City FC of the Southern Football League Premier Division now play in the adjoining village of Histon. Formed in Cambridge in 1908 as Cambridge Town, the club were Southern Premier League champions in 1962-63, the highest they have finished in the English football pyramid. After a legal dispute with their landlords, the club left their home ground in Cambridge in order to groundshare with fellow Southern League Premier club Histon FC in 2013-14 and intend to construct a new ground outside the city, in Sawston. As well as being the home of the Cambridge Rules in football, Parker's Piece was used for first-class cricket matches from 1817 to 1864. The University of Cambridge's cricket ground, Fenner's, is located in the city and is one of the home grounds for minor counties team Cambridgeshire CCC. There are seven amateur cricket clubs within the city: Cambridge Granta, Camden, Cambridge St Giles, New Chesterton Institute, Fen Ditton, Romsey Town and Cherry Hinton. The city is represented in both codes of Rugby football. Rugby Union club Cambridge R.U.F.C. were founded in 1923, and play in National League One at their home ground, Grantchester Road, in the southwest corner of the city. Cambridge Lions represent the city in rugby league, and are members of East Rugby League. The River Cam running through the city centre is used for boating. The University and its colleges are well known for rowing and the Cambridgeshire Rowing Association, formed in 1868, organises competitive rowing on the river outside of the University. Rowing clubs based in the city include City of Cambridge RC, Cambridge '99 RC, Cantabrigian RC and Rob Roy BC. Shallower parts of the Cam are used for recreational punting, a type of boating in which the craft is propelled by pushing against the river bed with a quant pole. Cambridge Swimming Club, Cambridge Dive team, and City of Cambridge Water Polo Club are all based at Parkside Swimming Pool. Cambridge is home to two Real Tennis courts out of just 42 in the world at Cambridge University Real Tennis Club. British American Football League club Cambridgeshire Cats play at Coldham's Common. Cambridge Royals are members of the British Baseball Federation's Triple-A South Division. Cambridge has two cycling clubs Team Cambridge and Cambridge Cycling Club. Cambridge & Coleridge Athletic Club is the city's track and field club, based at the University of Cambridge's Wilberforce Road track. Cambridge Handball Club compete in the men's England Handball National Super 8 League, and the women's England Handball National Super 7 League. The city is also represented in polo by Cambridge Polo Club, based in Barton, just outside the city. The Romsey Town Rollerbillies play roller derby in Cambridge. Speedway racing was formerly staged at a greyhound stadium in Coldhams Lane. Cambridge is also known for the sporting events between the University of Cambridge and the University of Oxford, especially the rugby union Varsity Match and the Boat Race, though many of these do not take place within Cambridge. Cambridge's main traditional theatre is the Arts Theatre, a venue with 666 seats in the town centre. The theatre often has touring shows, as well as those by local companies. The largest venue in the city to regular hold theatrical performances is the Cambridge Corn Exchange with a capacity of 1,800 standing or 1,200 seated. Housed within the city's 19th century former corn exchange building the venue was used for a variety of additional functions throughout the 20th century including tea parties, motor shows, sports matches and a music venue with temporary stage. The City Council renovated the building in the 1980s, turning it into a full-time arts venue, hosting theatre, dance and music performances. The newest theatre venue in Cambridge is the 220-seat J2, part of Cambridge Junction in Cambridge Leisure Park. The venue was opened in 2005 and hosts theatre, dance, live music and comedy The ADC Theatre is managed by the University of Cambridge, and typically has 3 shows a week during term time. It hosts the Cambridge University Footlights Dramatic Club which has produced many notable figures in British comedy. The Mumford Theatre is part of Anglia Ruskin University, and hosts shows by both student and non-student groups. There are also a number of venues within the colleges. Within the city there are several notable museums, some run by the University of Cambridge Museums consortium and others independent of it. The Fitzwilliam Museum is the city's largest, and is the lead museum of the University of Cambridge Museums. Founded in 1816 from the bequeathment and collections of Richard, Viscount FitzWilliam, the museum was originally located in the building of the Perse Grammar School in Free School Lane. After a brief housing in the University of Cambridge library, it moved to its current, purpose-built building on Trumpington Street in 1848. The museum has five departments: Antiquities; Applied Arts; Coins and Medals; Manuscripts and Printed Books; and Paintings, Drawings and Prints. Other members of the University of Cambridge Museums are the Museum of Archaeology and Anthropology, The Polar Museum, The Sedgwick Museum of Earth Sciences, Museum of Classical Archaeology, The Whipple Museum of the History of Science, and the University Museum of Zoology. The Museum of Cambridge, formerly known as the Cambridge & County Folk Museum, is a social history museum located in a former pub on Castle Street. The Centre for Computing History, a museum dedicated to the story of the Information age, moved to Cambridge from Haverhill in 2013. Housed in a former sewage pumping station, the Cambridge Museum of Technology has a collection of large exhibits related to the city's industrial heritage. Pink Floyd are the most notable band with roots in Cambridge. The band's former songwriter, guitarist and vocalist Syd Barrett was born and lived in the city, and he and another founding member, Roger Waters, went to school together at Cambridgeshire High School for Boys. David Gilmour, the guitarist who replaced Barrett, was also a Cambridge resident and attended the nearby Perse School. Bands who were formed in Cambridge include Clean Bandit, Henry Cow, The Movies, Katrina and the Waves, The Soft Boys, Ezio The Broken Family Band, Uncle Acid & the Deadbeats, and the pop-classical group King's Singers, who were formed at the University. Solo artist Boo Hewerdine is from Cambridge, as are drum and bass artists (and brothers) Nu:Tone and Logistics. Singers Matthew Bellamy, of the rock band Muse, Tom Robinson, and Olivia Newton-John were born in the city. 2012 Mercury Prize winners Alt-J are based in Cambridge. Live music venues hosting popular music in the city include the Cambridge Corn Exchange, Cambridge Junction and the Portland Arms. Cambridge contains the Kettle's Yard gallery and the artist run organisations Aid and Abet, Cambridge Art Salon, and Changing Spaces. Wysing Arts Centre, one of the leading research centres for the visual arts in Europe, is associated with the city, though is located several miles west of Cambridge. Anglia Ruskin University operates the publicly accessible Ruskin Gallery within the Cambridge School of Art. Several fairs and festivals take place in Cambridge, mostly during the British summer. Midsummer Fair dates back to 1211, when it was granted a charter by King John. Today it exists primarily as an annual funfair with the vestige of a market attached and is held over several days around or close to midsummers day. On the first Saturday in June Midsummer Common is the site for Strawberry Fair, a free music and children's fair, with various market stalls. For one week in May, on Jesus Green, the annual Cambridge Beer Festival has been held since 1974. Cambridge Folk Festival is held annually in the grounds of Cherry Hinton Hall. The festival has been organised by the city council since its inception in 1964. The Cambridge Summer Music Festival is an annual festival of classical music, held in the University's colleges and chapels. The Cambridge Shakespeare Festival is an eight-week season of open-air performances of the works of William Shakespeare, held in the gardens of various colleges of the university. Started in 1977, the Cambridge Film Festival was held annually in July, moving to September in 2008 to avoid a clash with the rescheduled Edinburgh Film Festival. The Cambridge Science Festival, typically held annually in March, is the United Kingdom's largest free science festival. Between 1975 and 1985 the Cambridge Poetry Festival was held binannually. Other festivals include the annual Mill Road Winter Fair, held the first Saturday of December, the E-luminate Festival, which has taken place every November since 2013, and The Big Weekend, is a city outdoor event organised by the City Council every July. The city has been the setting for all or part of several novels, including Douglas Adams' Dirk Gently's Holistic Detective Agency, Rose Macaulay's They Were Defeated, Kate Atkinson's Case Histories, Rebecca Stott's Ghostwalk and Robert Harris's Enigma, while Susanna Gregory wrote a series of novels set in 14th century Cambridge. Gwen Raverat, the granddaughter of Charles Darwin, talked about her late Victorian Cambridge childhood in her memoir Period Piece and The Night Climbers of Cambridge is a book written by Noel Symington under the pseudonym "Whipplesnaith" about nocturnal climbing on the colleges and town buildings of Cambridge in the 1930s. Fictionalised versions of Cambridge appear in Philippa Pearce's Tom's Midnight Garden and Minnow on the Say, the city renamed as Castleford, and as the home of Tom Sharpe's fictional college in Porterhouse Blue. ITV TV series Granchester was partly filmed in Cambridge. Cambridge is served by Cambridge University Hospitals NHS Foundation Trust, with several smaller medical centres in the city and a teaching hospital at Addenbrooke's. Located on the Cambridge Biomedical Campus, Addenbrooke's is one of the largest hospitals in the United Kingdom and is a designated regional trauma centre. The East of England Ambulance Service covers the city and has an ambulance station on Hills Road. The smaller Brookfields Hospital stands on Mill Road. Cambridgeshire Constabulary provides the city's policing; the main police station is at Parkside, adjacent to the city's fire station, operated by Cambridgeshire Fire and Rescue Service. Cambridge Water Company supplies water services to the city, while Anglian Water provides sewerage services. For the supply of electricity, Cambridge is part of the East of England region, for which the distribution network operator is UK Power Networks. The city has no power stations, though a five-metre wind turbine, part of a Cambridge Regional College development, can be seen in King's Hedges. Following the Public Libraries Act 1850 the city's first public library, located on Jesus Lane, was opened in 1855. It was moved to the Guildhall in 1862, and is now located in the Grand Arcade shopping centre. The library was reopened in September 2009, after having been closed for refurbishment for 33 months, more than twice as long as was forecast when the library closed for redevelopment in January 2007. As of 2018 the city contains six public libraries, run by the County Council. The Cambridge City Cemetery is located to the north of Newmarket Road. Cambridge has a number of churches, some of which form a significant part of the city's architectural landscape. Like the rest of Cambridgeshire it is part of the Anglican Diocese of Ely. A Cambridge-based family and youth organisation, Romsey Mill, had its centre re-dedicated in 2007 by the Archbishop of York, and is quoted as an example of best practice in a study into social inclusion by the East of England Regional Assembly. Great St Mary's Church has the status of "University Church". Many of the University colleges contain chapels that hold services according to the rites and ceremonies of the Church of England, while the chapel of St Edmund's College is Roman Catholic. The city also has a number of theological colleges training clergy for ordination into a number of denominations, with affiliations to both the University of Cambridge and Anglia Ruskin University. Cambridge is in the Roman Catholic Diocese of East Anglia and is served by the large Gothic Revival Our Lady and the English Martyrs Church at the junction of Hills Road and Lensfield Road, St Laurence's on Milton Road, St Vincent De Paul Church on Ditton Lane and by the church of St Philip Howard, in Cherry Hinton Road. There is a Russian Orthodox church under the Diocese of Sourozh who worship at the chapel of Westcott House, and the Greek Orthodox Church holds services at the church St Athanasios under the Archdiocese of Thyateira and Great Britain. There are three Quaker Meetings in Cambridge, located on Jesus Lane, Hartington Grove, and a Meeting called "Oast House" that meets in Pembroke College. An Orthodox synagogue and Jewish student centre is located on Thompson's Lane, operated jointly by the Cambridge Traditional Jewish Congregation and the Cambridge University Jewish Society, which is affiliated to the Union of Jewish Students. The Beth Shalom Reform synagogue which previously met at a local school, has recently opened a purpose-built synagogue. There is also a student-led egalitarian minyan which holds services on Friday evenings. The Abu Bakr Jamia Islamic Centre on Mawson Road and the Omar Faruque Mosque and Cultural Centre in Kings Hedges serve the city's community of around 4,000 Muslims until a planned new mosque is built. A Buddhist centre was opened in the former Barnwell Theatre on Newmarket Road in 1998. A Hindu shrine was opened in 2010 at the Bharat Bhavan Indian cultural centre off Mill Road. ^ a b UK Census (2011). "Local Area Report – Cambridge Local Authority (2092957699)". Nomis. Office for National Statistics. Retrieved 8 February 2018. ^ "Cambridge". Collins Dictionary. n.d. Retrieved 24 September 2014. ^ "1000 Largest Cities in the UK". The Geographist. 2013. Archived from the original on 9 May 2014. Retrieved 15 February 2014. ^ Cairns, Richard (1 October 2011). "What it takes to make it to Oxbridge". The Daily Telegraph. London. Retrieved 26 February 2012. ^ "Papworth heart and lung specialist hospital to move". BBC News. 3 December 2013. ^ "Bronze Age site is found in city". BBC News. 17 January 2008. Retrieved 5 February 2009. ^ "A brief history of Cambridge". Cambridge City Council. 2010. Retrieved 27 June 2010. ^ Gray, Ronald D; Stubbings, Derek (2000). Cambridge Street-Names: Their Origins and Associations. Cambridge: Cambridge University Press. pp. 2–3. ^ "Schoolgirls unearth Roman village under College garden". University of Cambridge. 22 September 2010. Retrieved 26 February 2012. Large amounts of Roman pottery convinced both Dr Hills and Dr Lewis that they had dug through to the remains of a 2,000-year-old settlement, significant because it suggests that the Roman presence at Newnham was far more considerable than previously thought. ^ Although note that Bishop Ussher believed the listing to refer to the Cambridge in Gloucestershire. ^ Burnham, Barry C; Wacher, John (1990). The Small Towns of Roman Britain. London: B T Batsford. ^ a b c d Roach, J.P.C., ed. (1959). "The city of Cambridge: Medieval history". A History of the County of Cambridge and the Isle of Ely: Volume 3: The City and University of Cambridge. Institute of Historical Research. Retrieved 18 July 2011. ^ In the Anglo-Saxon Chronicle, cited by Roach. ^ Chance, F. (13 November 1869). "Cambridge". Notes and Queries: A Medium of Inter-Communication for Literary Men, General Readers, etc. London: Bell & Daldy. 4: 401–404. OCLC 644126889. Retrieved 25 February 2012. ^ Taylor, Kevin (31 March 1994). Central Cambridge: A Guide to the University and Colleges. Cambridge University Press. p. 34. Retrieved 13 September 2016. ^ a b c Nugent Lawrence Brooke, Christopher; Riehl Leader, Damien (1988). A history of the University of Cambridge. 1. Cambridge University Press. pp. 9–10 . ISBN 0-521-32882-9. ^ a b Roach, J.P.C., ed. (1959). "The city of Cambridge: Constitutional history". A History of the County of Cambridge and the Isle of Ely: Volume 3: The City and University of Cambridge. Institute of Historical Research. Retrieved 26 February 2012. ^ Roach, RPC, ed. (1959). The city of Cambridge: Churches; A History of the County of Cambridge and the Isle of Ely: Volume 3, the City and University of Cambridge. London: Victoria County History. pp. 123–132. Retrieved 23 September 2016. ^ "University and Colleges: A Brief History". University of Cambridge. 7 February 2008. Retrieved 13 January 2010. ^ "About the College". Peterhouse College. Retrieved 13 January 2010. ^ a b Ziegler, Philip; Platt, Colin (1998). The Black Death (2nd ed.). London: Penguin. p. 178. ISBN 978-0-14-027524-7. ^ Atkinson, Thomas (1897). Cambridge, Described and Illustrated: Being a Short History of the Town and University. London: Macmillan. p. 41. OCLC 1663499. The Ward beyond the Bridge, that is, all the town on the Castle side of the river, appears to have been almost entirely destroyed. Most of the people in the parish of All Saints' in Castro died and those that escaped left the neighbourhood for other parishes. ^ Herlihy, David (1997). The Black Death and the Transformation of the West (European History Series). Harvard University Press. p. 70. ISBN 978-0-674-07613-6. Retrieved 25 February 2012. ^ a b "History of the Chapel". King's College, Cambridge. Retrieved 19 July 2011. ^ The city of Cambridge: Public health; A History of the County of Cambridge and the Isle of Ely: Volume 3, the City and University of Cambridge. London: Victoria County History. 1959. pp. 101–108. Retrieved 23 September 2016. ^ "Cambridgeshire > Natural History > Cam Valley Walk > Stage 7". BBC Cambridgeshire. Retrieved 23 July 2013. ^ a b c d e f "The city of Cambridge – Modern history | A History of the County of Cambridge and the Isle of Ely: Volume 3: The City and University of Cambridge (1959)". 1959. pp. 15–29. Retrieved 26 February 2012. ^ "The city of Cambridge: Modern history | British History Online". www.british-history.ac.uk. Retrieved 2018-07-06. ^ Shott, Rupert (2009). Rowan's Rule: the biography of the Archbishop. London: Hodder & Stoughton. p. 83. ISBN 978-0-340-95433-1. Retrieved 8 September 2016. ^ "Christ's Lane". Land Securities. n.d. Archived from the original on 7 September 2008. Retrieved 13 January 2010. ^ "Derek Taunt – Obituary". The Daily Telegraph. London. 23 July 2004. Retrieved 26 February 2012. ^ "The Open University in the East of England". Retrieved 2 February 2017. ^ "Ceremonial maces, 1207 charter and the city's coat of arms". Cambridge City Council. Archived from the original on 16 October 2015. Retrieved 8 June 2015. ^ "The mayors of Cambridge". Cambridge City Council. Archived from the original on 23 September 2009. Retrieved 4 March 2011. ^ "Elections 2014: Labour takes control of Cambridge City Council". Cambridge News. 23 May 2014. Archived from the original on 25 May 2014. Retrieved 24 May 2014. ^ "Cambridgeshire County Council". BBC News. Retrieved 2018-08-02. ^ "Ordnance Survey". Election maps. Retrieved 17 July 2010. ^ a b "Cambridgeshire South parliamentary constituency - Election 2017". BBC News. Archived from the original on 31 December 2018. Retrieved 31 December 2018. ^ Khomami, Nadia (2015-10-20). "Heidi Allen MP: Tory tax credit rebel". The Guardian. ISSN 0261-3077. Retrieved 2018-12-31. ^ "Cambridge (England, United Kingdom)". Britannica Online Encyclopedia. Retrieved 13 January 2010. ^ a b c "Wayback Machine" (PDF). 2016-12-20. Archived from the original (PDF) on 2016-12-20. Retrieved 2018-04-02. ^ a b "England's Geology – Cambridgeshire". Natural England. Archived from the original on 21 October 2009. Retrieved 27 February 2012. ^ "CB1 development". Cambridgshire County Council. Archived from the original on 9 October 2010. Retrieved 13 January 2010. ^ "Accordia wins top architectural prize" (Press release). Cambridge City Council. 15 October 2008. Archived from the original on 14 December 2010. Retrieved 13 January 2010. ^ "Vision". Clay Farm. Archived from the original on 9 January 2010. Retrieved 13 January 2010. ^ "Home". Trumpington Meadows Land Company. Archived from the original on 31 August 2009. Retrieved 13 January 2010. ^ "Air Pollution in Cambridge". Cambridge City Council. Archived from the original on 16 November 2018. Retrieved 3 June 2016. ^ "Cambridge, England Köppen Climate Classification (Weatherbase)". Weatherbase. Retrieved 2018-11-13. ^ "Cambridge University Computer Laboratory Digital Technology Group". Retrieved 26 September 2014. ^ "Weather Station, Cambridge University Computer Laboratory Digital Technology Group". Retrieved 26 September 2014. ^ Perring, Franklyn (16 June 1960). "Mapping the Distribution of Flowering Plants". New Scientist: 1525. Retrieved 26 February 2012. ^ "Climate & Soils". Cambridge University Botanic Garden. 2012. Archived from the original on 1 April 2012. Retrieved 26 February 2012. Cambridge is in the driest region of Britain and has a more continental climate than most of Britain. ^ "Our strategy". Cambridge Water. 2012. Archived from the original on 27 March 2012. Retrieved 26 February 2012. We live in one of the driest areas of the UK. The East of England's rainfall of conditions is only half the national average and Cambridge is one of the driest parts of this region. ^ "Climate and Soils". Cambridge University Botanic Garden. Archived from the original on 26 July 2011. Retrieved 21 February 2011. ^ "NIAB weather data". Met Office. Archived from the original on 29 June 2011. Retrieved 4 February 2013. ^ "Wettest year since records began". Cambridge University Botanic Garden. Retrieved 4 February 2013. ^ "Historic station data: Cambridge NIAB". Met Office. Archived from the original on 29 June 2011. Retrieved 21 February 2011. ^ a b "Anomaly details for Station Cambridge (B. GDNS): Mean of daily maximum temperature, July 2006". European Climate Assessment and Dataset. Retrieved 21 February 2011. ^ "UK Climate: July 2008". Met Office. Archived from the original on 29 June 2011. Retrieved 21 February 2011. ^ "Anomaly details for Station Cambridge (B. GDNS): Maximum value of daily maximum temperature, August 2007". European Climate Assessment and Dataset. Retrieved 21 February 2011. ^ "Anomaly details for Station Cambridge (B. GDNS): Maximum value of daily maximum temperature, August 2003". European Climate Assessment and Dataset. Retrieved 21 February 2011. ^ "August 2003 – Hot spell". Met Office. Retrieved 21 February 2011. ^ "Hot spell August 1990". Met Office. Retrieved 21 February 2011. ^ "July 2006". Met Office. Archived from the original on 29 June 2011. Retrieved 21 February 2011. ^ "Climatology details for station CAMBRIDGE (B. GDNS): Summer days (TX > 25 °C)". European Climate Assessment and Dataset. Retrieved 11 September 2012. ^ "Climatology details for station CAMBRIDGE (B. GDNS): Maximum value of daily maximum temperature". European Climate Assessment and Dataset. Retrieved 11 September 2012. ^ "Botanic Garden Extremes 1931–60". Archived from the original on 26 July 2011. Retrieved 21 February 2011. ^ "8 December 1879". Retrieved 21 February 2011. ^ "Coldest temperatures of winter so far". Met Office News Blog. 11 February 2012. Retrieved 27 February 2012. ^ "22nd Jan 2013 Temperatures". Met Office News Blog. 22 January 2013. Retrieved 4 February 2013. ^ "December 2010". Cambridge University Botanic Garden. Archived from the original on 26 July 2011. Retrieved 21 February 2011. ^ "Cambridge 1981–2010 averages". Met Office. Retrieved 11 September 2012. ^ "Climatology details for station CAMBRIDGE (B. GDNS): Frost days (TN < 0 °C)". European Climate Assessment and Dataset. Retrieved 11 September 2012. ^ "Climatology details for station CAMBRIDGE (B. GDNS): Minimum value of daily minimum temperature". European Climate Assessment and Dataset. Retrieved 11 September 2012. ^ "Cambridge City Local Nature Reserves". Cambridge City Council. Retrieved 16 May 2016. ^ "Green belt final" (PDF). www.eastcambs.gov.uk. ^ "CAMBRIDGE GREEN BELT STUDY A Vision of the Future for Cambridge in its Green Belt Setting" (PDF). www.scambs.gov.uk. Archived from the original (PDF) on 15 February 2018. Retrieved 14 February 2018. ^ "East Cambridgeshire Local Plan - April 2015" (PDF). www.eastcambs.gov.uk. ^ "LDA Design - Cambridge Inner Belt Boundary Study" (PDF). www.cambridge.gov.uk. ^ 2001 Census (Ethnic group, Cambridge local authority). Office For National Statistics. ^ "University of Cambridge Fact Sheet: Ethnicity". Archived from the original on 1 January 2008. Retrieved 17 January 2008. .Retrieved 17 January 2008. ^ "Cambridge Civil Parish". Vision of Britain. Retrieved 26 July 2008. ^ Boyd, Stephanie (2005). The Story of Cambridge. Cambridge University Press. ISBN 978-0-521-62897-6. ^ a b Kimber, Isaac; Kimber, Edward (January 1748). "A description of Cambridge". The London magazine, or, Gentleman's monthly intelligencer. London: R. Baldwin. 17: 64. Retrieved 29 February 2012. ^ Searby, Peter (1997). A History of the University of Cambridge. 3. Cambridge University Press. p. 705. ISBN 978-0-521-35060-0. ^ "Cambridge City – Annual demographic and socio-economic report" (PDF). Cambridgeshire County Council. April 2011. p. 17. Archived from the original (PDF) on 28 August 2013. ^ Kiladze, Tim (22 January 2010). "World's Most Beautiful Cities". Forbes. ^ Gooding, Matt (2017-06-05). "Dramatic increase in tourism's contribution to the Cambridge economy revealed". cambridgenews. Retrieved 2018-02-12. ^ "History". Cambridge Science Park. Retrieved 14 August 2011. ^ "History". St John's Innovation Centre. Archived from the original on 7 July 2011. Retrieved 19 July 2011. ^ "Directory of Cambridge Network Members – Cambridge University Spin Out". Cambridge Network. 2012. Archived from the original on 29 April 2007. Retrieved 29 February 2012. ^ "Cambridge Futures 2 – Report". Cambridgefutures.org. Archived from the original on 30 January 2013. Retrieved 26 March 2013. ^ Cambridge retains 'cycling capital' title in nationwide survey | Cambridge News | Latest News Headlines From Cambridge City & Cambridgeshire | National News By Archived 19 April 2013 at the Wayback Machine. Cambridge News (16 April 2013). Retrieved on 15 July 2013. ^ "The Busway - Routes and Times". Cambridgeshire County Council. Archived from the original on 25 December 2014. Retrieved 29 December 2014. ^ "Archived copy". Archived from the original on 11 December 2009. Retrieved 14 October 2009. CS1 maint: Archived copy as title (link) "Cambridge Airport"
^  Archived 11 December 2008 at the Wayback Machine"Cambridge Aero Club"
^ Cambridge Airport axes charter and scheduled passenger flights Archived 20 December 2015 at the Wayback Machine, Cambridge News, 2 December 2015. Retrieved 2016-02-02. ^ Fellowes, Reginald B (1948). Railways to Cambridge - actual and proposed) (1976 reprint ed.). Cambridge,UK: Oleander Press. p. 10. ISBN 0 902675 62 1. ^ "Train Timetables" (PDF). Great Northern. Retrieved 17 December 2017. ^ Brown, Raymond (21 May 2017). "First train arrives at Cambridge North station - but it took 30 years to get there". Cambridge Evening News. Retrieved 21 May 2017. ^ "PICTURES: First step towards opening of Cambridge's second railway station as work starts on guided busway extension". Cambridge News. 23 July 2014. Archived from the original on 5 September 2014. Retrieved 15 September 2014. ^ "Cambridge's new railway station 'to open in 2015'". Cambridge News. 21 February 2012. Archived from the original on 24 February 2012. Retrieved 27 February 2012. ^ Cox, Tara (May 16, 2018). "2025 opening for Cambridge South station is 'unacceptable'". Local World. Retrieved 31 May 2018. ^ "Draft housing strategy 2009–2010" (PDF). Cambridge City Council. Archived from the original (PDF) on 17 July 2010. Retrieved 28 September 2009. ^ "Cambridge". The Complete University Guide. Archived from the original on 14 January 2013. Retrieved 28 September 2009. ^ "Facts and Figures January 2009" (PDF). University of Cambridge: Planning and statistics section. January 2009. Retrieved 28 September 2009. ^ "Our schools and colleges". Cambridgeshire County Council. Archived from the original on 2 April 2009. Retrieved 28 September 2009. ^ "Educational establishments in Cambridgeshire". Cambridgeshire County Council. ^ Morgan, John (27 August 2009). "It's a record breaker for GCSE students". Cambridge News. Archived from the original on 29 July 2012. Retrieved 28 September 2009. ^ Foskett, Nicholas (1992). Managing external relations in schools: a practical guide. Routledge. p. 149. ISBN 0-415-06833-9. ^ Davidson, Max (20 May 2006). "City spotlight: Cambridge". The Daily Telegraph. London. Retrieved 28 September 2009. ^ "Cambridge...the birthplace of football?!". BBC. ^ Conn, David (3 October 2007). "The supporters who took on a property developer and won". The Guardian. Retrieved 3 September 2014. ^ "List of first-class matches on Parker's Piece". Cricketarchive.com. Retrieved 17 July 2010. ^ "About Us". Cambridgeshire CCC. Archived from the original on 17 July 2012. Retrieved 6 January 2009. ^ "Cambridgeshire Cricket Association". Cambridgeshire CA. Retrieved 5 October 2011. ^ Jackson, Steve (5 September 2008). "Cambridge RUFC season preview". BBC Sport. BBC. Retrieved 16 September 2016. ^ "Early CRA History". Cambridgeshire Rowing Association. Archived from the original on 19 May 2009. Retrieved 14 January 2009. ^ "Parkside Pools". Cambridge City Council. Retrieved 20 April 2016. ^ "Cambridge University Real Tennis Club". Curtc.net. Retrieved 17 July 2010. ^ "Triple-A South, Double-A Central and Northern Conference 2016 schedules announced". British Baseball Federation. 18 February 2016. Retrieved 12 October 2016. ^ "Team Cambridge". Team Cambridge. Retrieved 17 July 2010. ^ "Cambridge CC". Cambridge-cycling-club.org.uk. Retrieved 17 July 2010. ^ "Cambridge & Coleridge AC official website". ^ "Uk Roller Derby". Uk Roller Derby. Archived from the original on 24 October 2011. Retrieved 31 October 2011. ^ "Cambridge Speedway". www.speedwayplus.com. Retrieved 20 September 2016. ^ "Cambridge Arts Theatre Website". Cambridgeartstheatre.com. Retrieved 17 July 2010. ^ a b "The History of the Cambridge Corn Exchange". Cambridge City Council. Archived from the original on 29 August 2008. Retrieved 2 March 2009. ^ a b J P C Roach, ed. (1959). "The University of Cambridge — The Fitzwilliam Museum". A History of the County of Cambridge and the Isle of Ely: Volume 3, the City and University of Cambridge: 326–327. ^ "Museum of Cambridge: The life and history of the people of Cambridge". Fen Museum Partnership. Retrieved 13 September 2016. ^ "Cambridge Centre of Computing History opens". BBC News. 30 July 2013. Retrieved 13 September 2016. ^ "The Broken Family Band biography". www.xfm.co.uk. Archived from the original on 20 December 2008. Retrieved 13 August 2008. ^ Rivadavia, Eduardo. "Uncle Acid and the Deadbeats: Blood Lust". AllMusic. Retrieved 2 June 2013. ^ "The Official Kings Singers Website :History". kingssingers.com. 2012. Archived from the original on 10 October 2011. Retrieved 25 February 2012. The group takes its name from King's College Cambridge, where Martin Lane, Al Hume, Alastair Thompson, Richard Salter, Simon Carrington and Brian Kay were choral scholars. ^ Cheal, David (13 April 2001). "Muse: profile of the band". The Daily Telegraph. London. Retrieved 28 February 2012. ^ "Tom Robinson is showing a new generation the power of the protest song". The Independent. Retrieved 11 February 2016. ^ "Biography". www.olivia-newtonjohn.com. Retrieved 9 December 2008. ^ Jane, Sarah (2 November 2012). "BBC News – Mercury Prize: Alt-J album An Awesome Wave wins award". Bbc.co.uk. Retrieved 26 March 2013. ^ Collins, Ruthie (3 January 2013). "Cambridge art scene: change in the air". The guardian. Guardian Media Group. Retrieved 20 April 2016. ^ "About the gallery". Anglia Ruskin University. Retrieved 18 May 2016. ^ "Cambridge Midsummer Fair". National Fairground Archive, University of Sheffield. Retrieved 26 April 2016. ^ "Cambridge & District CAMRA Winter Ale Festival 2010". Cambridgebeerfestival.com. Retrieved 13 January 2010. ^ "Cambridge Summer Music Festival". The Gramophone. Retrieved 20 October 2010. ^ "About the Festival". The Cambridge Shakespeare Festival. Retrieved 27 February 2012. ^ "Cambridge Film Festival". Festival Focus. Archived from the original on 2 July 2008. Retrieved 21 July 2008. ^ "University of Cambridge Science Festival 2011". BBC News. Retrieved 21 March 2015. ^ Blair-Underwood, Alison (2012). "Open account - A memoir: the Cambridge Poetry Festival". Blackbox Manifold, Issue 9: Peter Robinson at Sixty. Blackbox Manifold. Retrieved 6 June 2013. ^ Rabbett, Abigail (2017-12-01). "All you need to know about the 2017 Mill Road Winter Fair". cambridgenews. Retrieved 2018-05-31. ^ Rabbett, Abigail (17 Jan 2018). "Cambridge News". Local World. Retrieved 31 May 2018. ^ "Big Weekend". Visit Cambridge. Cambridge City Council. Retrieved 31 May 2018. ^ "They were defeated". Evening Post. Wellington, NZ. 24 December 1932. p. 7. Retrieved 7 October 2010. ^ Owen, Katie (29 August 2004). "A Daily Sense of Danger – Case Histories by Kate Atkinson". The Daily Telegraph. London. Retrieved 25 February 2011. ^ "Woman's Hour -Rebecca Stott on 'Ghostwalk'". BBC Radio 4. 2012. Retrieved 25 February 2012. ^ Chainey, Graham (1995) . A Literary History of Cambridge. Cambridge. ISBN 0-907115-25-X. ^ Garrett, Martin (2004). Cambridge: a Cultural and Literary History. Oxford. ISBN 1-902669-79-7. ^ "GREGORY, SUSANNA | List of Writers". literaturewales.org. Archived from the original on 31 August 2013. Retrieved 25 February 2012. ^ "Some References to Cambridge Night Climbing". Archived from the original on 9 February 2009. Retrieved 26 August 2010. ^ Crowley, Joseph N. (1994). No equal in the world: an interpretation of the academic presidency. Reno, NV: University of Nevada Press. p. 167. ISBN 978-0-87417-237-9. Retrieved 25 February 2012. ^ "Grantchester – Drama Series Hits ITV 1". Visit Cambridge. Cambridge City Council. Retrieved 31 May 2018. ^ "East of England Ambulance Service NHS Trust". National Health Service. Archived from the original on 27 September 2011. Retrieved 28 September 2009. ^ "Brookfields Hospital". NHS.UK. Retrieved 4 February 2019. ^ "Contact us". Cambridgeshire Constabulary. Retrieved 28 September 2009. ^ "Cambridge fire station". Cambridgehsire Fire and Rescue. Archived from the original on 28 September 2009. Retrieved 28 September 2009. ^ "About Us". Cambridge Water Company. 2012. Archived from the original on 24 February 2012. Retrieved 26 February 2012. ^ "About you: water charges". Cambridge Water. Archived from the original on 16 September 2009. Retrieved 28 September 2009. Anglian Water supply your sewerage services. Cambridge Water bills and collects on behalf of Anglian Water. ^ Jones, Will (6 March 2008). "The SmartLIFE Sustainable Skills Centre in Cambridge". Building.co.uk. Retrieved 28 September 2009. ^ a b Roach, J.P.C., ed. (1959). "The city of Cambridge: Public buildings". A History of the County of Cambridge and the Isle of Ely: Volume 3: The City and University of Cambridge. Institute of Historical Research. Retrieved 19 July 2011. ^ a b "Revamped Central Library ready to open". Cambridge News. 25 September 2009. Archived from the original on 26 September 2012. Retrieved 28 September 2009. ^ Elliott, Chris (17 April 2009). "Library is hit by new delay fear". Cambridge News. Archived from the original on 26 September 2012. Retrieved 28 September 2009. ^ "Find a library". Cambridgeshire County Council. Retrieved 2018-02-09. ^ "A brief history of the Diocese of Ely". The Church Of England Diocese Of Ely. Archived from the original on 13 May 2016. Retrieved 26 April 2016. ^ "EERA 61 Social Strategy" (PDF). East of England Regional Assembly. Archived from the original (PDF) on 6 June 2011. Retrieved 17 July 2010. ^ "Great St Mary's". Great St Mary's Ministry. Archived from the original on 1 August 2012. Retrieved 21 March 2012. ^ "Chapel". St Edmund's College, Cambridge. 12 May 2008. Archived from the original on 23 September 2008. Retrieved 17 October 2008. ^ "Diocese of East Anglia". Catholic Directory. Retrieved 6 January 2015. ^ "Parishes – Diocese of Sourozh". Russian Orthodox Diocese of Sourozh. Retrieved 21 March 2012. ^ "The Greek Orthodox Church of St. Anthanasius and St. Clement". Greek Orthodox Archdiocese of Thyateira and Great Britain. Retrieved 21 March 2012. ^ "Quakers in Cambridge". Cambridge Quakers. Archived from the original on 25 July 2011. Retrieved 21 March 2012. ^ "Welcome to CTJC". Cambridge Traditional Jewish Congregation. Retrieved 28 February 2012. We share our shul building with the students, who run Shabbat services during term-time. ^ "Cambridge University | Union of Jewish Students". Cambridge University Union of Jewish Students. Archived from the original on 26 July 2012. Retrieved 28 February 2012. The Cambridge Traditional Jewish Congregation hold Orthodox services at Thompsons Lane which are run by the students during term time and the residents in the vacation. ^ "Home of its own: Cambridge Synagogue has a new base". BBC News. 12 April 2010. Retrieved 28 February 2012. ^ "Omar Faruque Mosque and Cultural Centre". Salatomatic. Retrieved 20 July 2010. ^ Extance, Rachel (6 May 2008). "Mosque site hunt is over". Cambridge News. Archived from the original on 5 January 2009. Retrieved 21 March 2012. ^ "History of the Barnwell or Festival Theatre". Cambridge Buddhist Centre. Retrieved 13 January 2010. ^ "The Indian Community and Culture Association of Cambridge (ICCA),". Bharat Bhavan Indian cultural centre. Archived from the original on 19 May 2012. Retrieved 3 March 2012. ^ "The Shrine". Bharat Bhavan Indian cultural centre. Archived from the original on 19 May 2012. Retrieved 3 March 2012. ^ a b "Twinning". City of Heidelberg. Archived from the original on 18 July 2006. Retrieved 12 November 2009. Wikivoyage has a travel guide for Cambridge.